The Green Imperial-Pigeon is widespread throughout its range and its populations are not currently threatened. 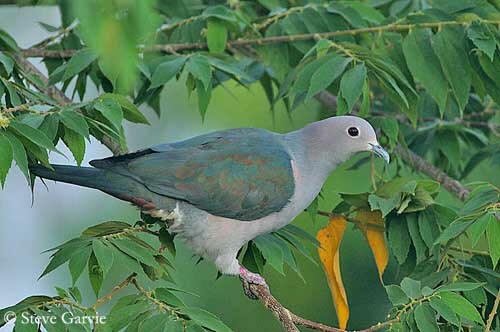 The Green Imperial-Pigeon is an arboreal species, a large plump Columbidae, widespread in most of its extensive range. In addition to the nominate race D.a. aenea, the races D.a. pusilla and D.a. paulina are displayed here. The adult male of nominate race has iridescent green upperparts tinged bluish or bronzy. The primary and outer secondary flight feathers and the rectrices are grey with slight greenish gloss. Head and neck, upper mantle, breast and belly are pale pinkish-grey. The undertail-coverts are dark chestnut. On the grey head, we can see some white feathers around the eyes and at bill base. The bill is bluish-grey. The eyes are deep red. Legs and feet are reddish. Both sexes are similar with the female slightly duller than male. The juvenile is duller than adults, with less pink on head and underparts. The subspecies “pusilla” from S India and Sri Lanka, is very similar to the nominate race. The subspecies “paulina” from Sulawesi and adjacent inlands in the north, differs from nominate by conspicuous rusty-brown nuchal patch. The mantle shows more strongly metallic appearance and rich green colour. The underparts are slightly darker, mainly on the foreneck. The other races vary extensively in coloration and iridescences. There are 13 subspecies which share the range in southern Asia, from India E to Indonesia. The Green Imperial-Pigeon is a vocal species. It utters single deep, loud “oom” while lowering the head, and a growling “kr-r-r-r-r”. The most often heard is a deep disyllabic “curr-hoo” or “koo koooo”. Actually, all these sounds are variations of the same call according to the situation. The birds of Sulawesi utter a questioning “woohoo woo”, whereas in India, they give longer call, a deep, resonant “wuck-wuck-woor” or “wuck-woor-woor-woor-woor”. 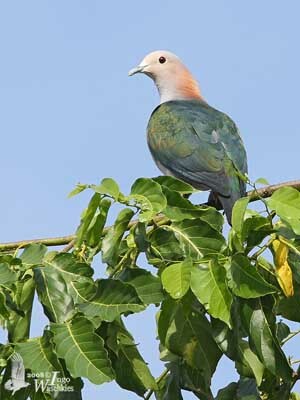 The Green Imperial-Pigeon is a forested species. It frequents both primary and secondary forests, mangroves and also open country with scattered trees. This species usually occurs in lowlands, but in India, it can be seen up to 300-600 metres of elevation, and in Sulawesi Islands, up to 1000 metres. 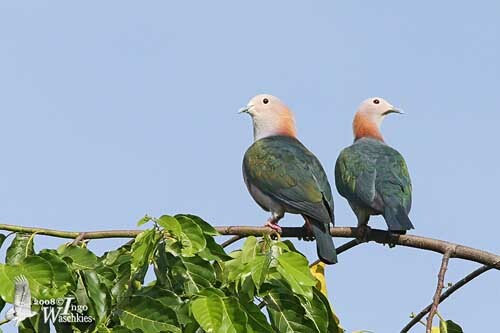 The Green Imperial-Pigeon is found in tropical southern Asia, from India E to Indonesia. The Green Imperial-Pigeon is frugivorous, eating numerous fruits and berries. Those from Ficus and Myristica are greatly appreciated. It is usually seen alone, in pairs or in small groups of 3-5 birds. But occasionally, flocks of up to 60 birds can be seen at fruiting trees and at roost. 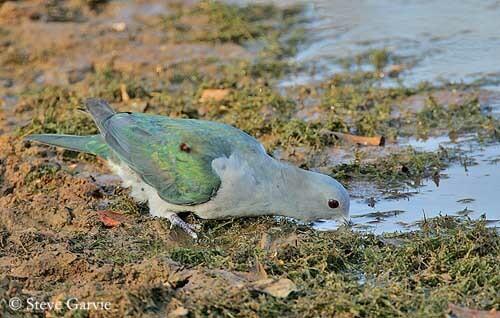 The Green Imperial-Pigeon uses nighttimes’ roosts in some areas, and year after year, the same roosts are occupied, and the same routes are used to reach them. 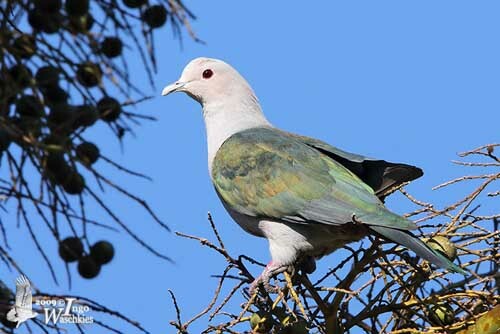 This arboreal pigeon forages mainly in the upper canopy, plucking small and large fruits from the branches. It is not aggressive towards other pigeons when feeding. It may come to the ground, first for drinking, and then, to lick salt-soils. 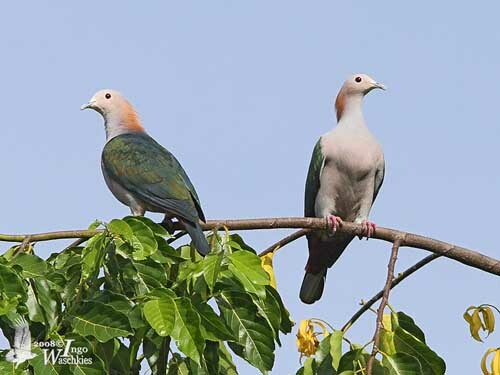 The courtship displays are typical of Columbidae species with the bowing display during which the bill is lowered against the breast while the male utters a deep “oom” call. It also performs a beautiful aerial display, rising with strong wing-beats, stalling a brief moment with wings flexed before diving down again and flying normally. 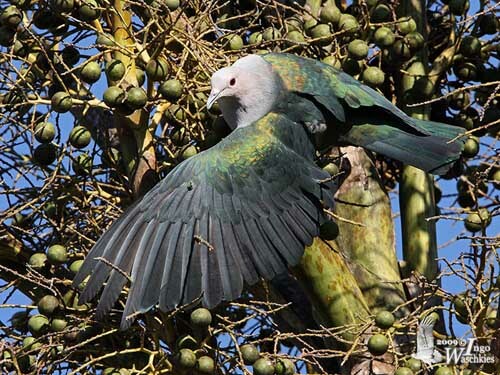 The Green Imperial-Pigeon is probably resident, only performing altitudinal movements when living in mountainous regions to find fruiting trees in lowlands. The Green Imperial-Pigeon performs fast, powerful direct flight. It often flies above the canopy. 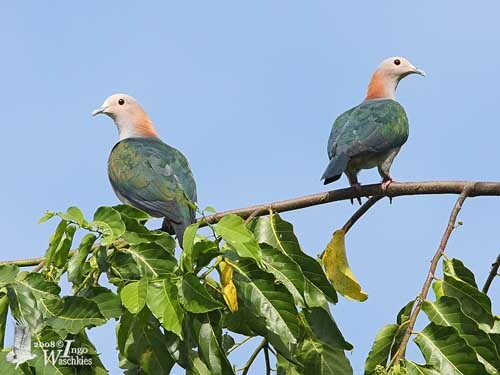 The breeding season varies according to the location, but the Green Imperial-Pigeon usually breeds during the summer, at the beginning of the rainy season. The nest is built by both sexes. That is a typical flimsy platform made with interwoven twigs, placed in small leafy tree, usually less than 10 metres up. The female lays a single white egg, rarely two. Both parents share the nesting duties and feed the chick. The Green Imperial-Pigeon feeds on ripe fruits and berries. Wild figs from Ficus and nutmegs from Myristica are its favourite food items. It often feeds in group at fruiting trees and takes active part in reforestation with the bones included in its droppings. It can also feed on buds of Avicennia.